With their soaring guitar solos elaborate grooves, delicate chord movements and intense build-ups combined with ethereal harmonies, Icelandic Psychedelic Prog Rockers LUCY IN BLUE have been taking their countrymen by storm. And, as of the 12th April, a wider audience will get to hear these stunning young musicians, because that’s when Karisma Records will release “In Flight”, the band’s sophomore full-length album. On the 14th April, LUCY IN BLUE’s Arnaldur Ingi Jónsson on Keyboards and vocals, Kolbeinn Þórsson on Drums, Matthías Hlífar Mogensen on Bass and vocals, and Steinþór Bjarni Gíslason on guitar will be live on stage for the band’s appearance at the Roadburn Festival in Tilburg, Netherlands. Karisma Records have revealed the details of the upcoming full-length album from Iceland’s Psychedelic Prog Rockers LUCY IN BLUE. 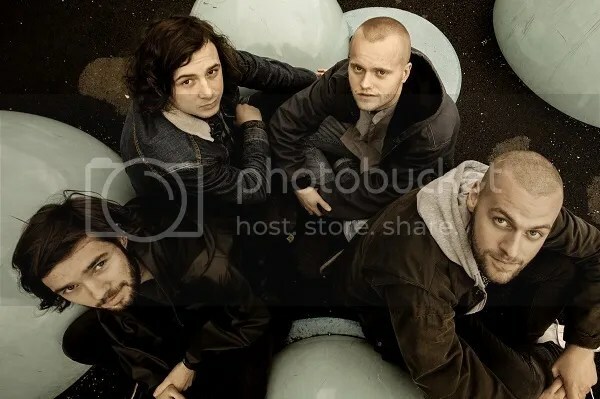 The eight-track album, titled “In Flight”, will be the second full-length release from the young band who are making considerable waves on the Icelandic Prog Scene with their elaborate grooves and delicate chord movements, performed with a skill that belies their age. “In Flight” is an album that amply showcases LUCY IN BLUE’s ethereal harmonies and philosophical lyrics, which deal not only with the whole spectrum of human emotion, but also touch on more political themes as well. Formed in 2013, LUCY IN BLUE released their self-titled debut album via Bandcamp in 2016, and, since then, the band has been stunning crowds in their native Iceland with their soaring guitar solos and intense build-ups, taking their audiences for a ride through the psychedelic soundscapes and the progressive song writing styles of the 1970’s. Finally, with the release of “In Flight” a much wider audience will be able to see LUCY IN BLUE’s Arnaldur Ingi Jónsson on Keyboards and vocals, Kolbeinn Þórsson on Drums, Matthías Hlífar Mogensen on Bass and vocals, and Steinþór Bjarni Gíslason on guitar and vocals in action, when they hit the stage at the Roadburn Festival in Tilburg, Netherlands, on the 14th April. With a lineup that comprises Eirik Sejersted Vognstølen on vocals and guitar, Jard Hole (LINT) on drums, Ole-Andreas Sæbø Jensen on bass, and Jonas Særsten (ex-TIEBREAKER) on keyboards, SHAMAN ELEPHANT is a band that exudes energy, both in the studio and on stage. And with its heavy riffs, flowing melodies and improvisation, “Crystals” is the perfect debut showcase for the Norwegians, who add elements of Jazz and Prog Rock to their Psychedelic Rock sound, giving it its own distinct individuality. Set for release on Karisma Records on the 9th December “Crystals” was recorded at the Solslottet and Duper Studio with producer Iver Sandøy, and is an album full of heavy riffs, flowing melodies and improvisation. There is Psychedelic Rock aplenty, spiced up with Jazz and Prog Rock. “Crystals” will be the first full-length album from the Norwegians, whose previous release was the three-track EP “More”. Whilst there is no doubt that SHAMAN ELEPHANT’s sound, replete with heavy riffs, flowing melodies and a good dose of improvisation, fits easily into the Psychedelic Rock genre, it is the additional elements of Jazz and Prog Rock that makes their music just that little bit different. Bergen-based Karisma Records have announced that they have added another talented young band to their ever growing label. The band in question is SHAMAN ELEPHANT, who describe their musical style as Psychedelic Rock with elements from other genres such as Jazz and Prog Rock, and who aim to deliver energetic performances both in the studio and on the stage with their heavy riffs, flowing melodies and improvisations. With a sound influenced by the ’70’s and drawing inspiration from artists as diverse as JIMI HENDRIX, The MAHAVISHNU ORCHESTRA and MOTORPSYCHO to STEELY DAN and BUSHMAN’s REVENGE, SHAMAN ELEPHANT’s lineup comprises Eirik Sejersted Vognstølen on vocals and guitar, Jard Hole (LINT) on drums, Ole-Andreas Sæbø Jensen on bass, and Jonas Særsten (ex-TIEBREAKER) on keyboards. SHAMAN ELEPHANT are expecting to enter the studio to record their debut full-length album in the spring of 2016. This will be the follow up to 2015’s “More”, a three-track EP which was released digitally through Lyd iLøo Records.